Experimental success? 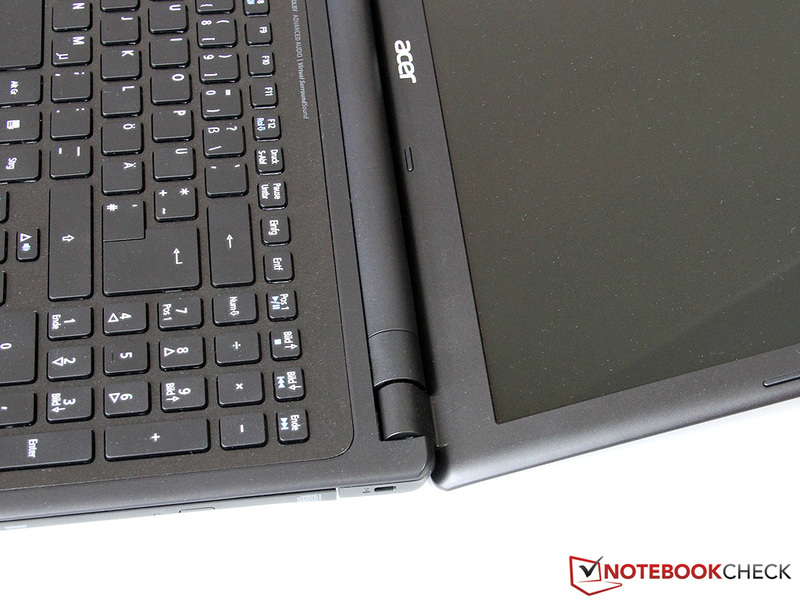 The Acer Aspire V5-571G attempts to serve as an affordable, slim, and gaming-capable 15-inch notebook using ULV hardware. Such a combination is sure to raise eyebrows. 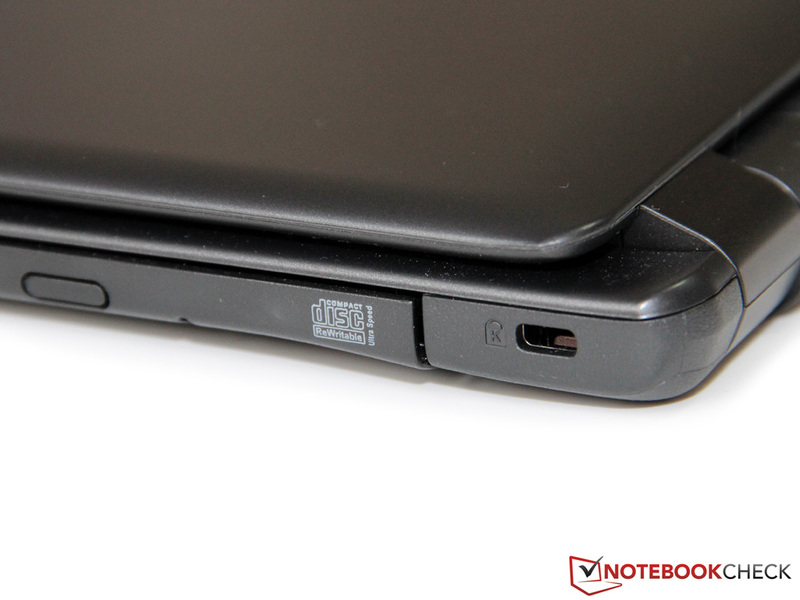 In this review, we will determine if the Aspire V5-571G is a multimedia notebook disguised as an ultrabook. As part of the evolution of notebooks, portable computing power in a slim package is no longer limited to expensive ultrabooks. An increasing number of traditional laptops are capable of delivering the desired performance and often at a considerably lower price. 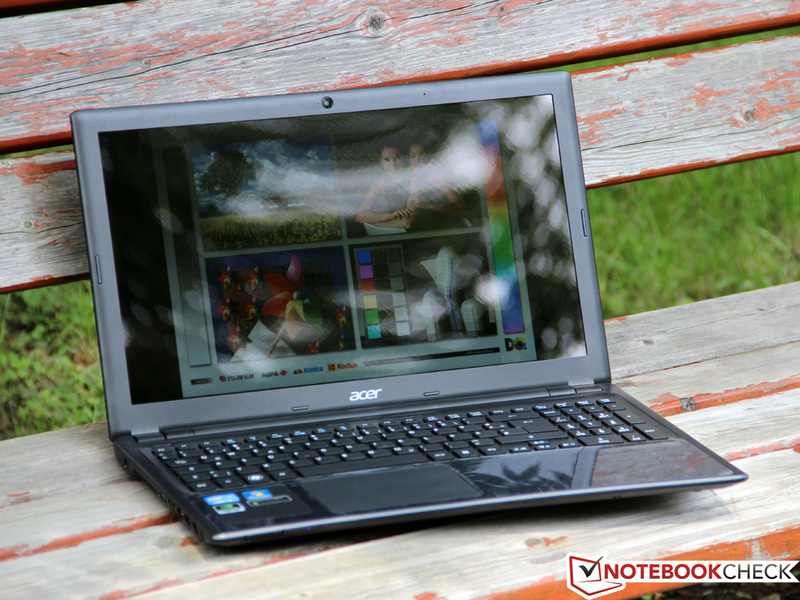 The Acer Aspire V5 Series is designed to fill the role of slim multimedia notebook and is available in 11.6-, 14.0-, and 15.6-inch form factors. The Aspire V5-531, a decent entry-level model equipped with the power-saving Pentium 967 processor, is the cheapest of the series with a price target of merely 400 Euro (~ $500). 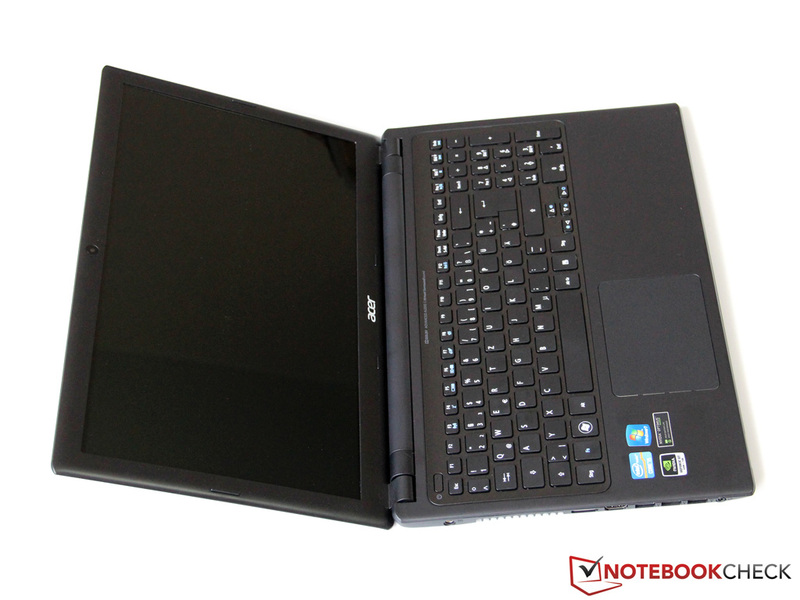 This notebook is designed to compete primarily with AMD-powered notebooks based on the E-450 APU. 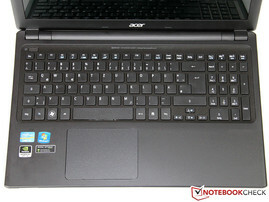 In this review, we will consider the top-of-the-line Acer Aspire V5-571G which carries a 600 Euro (~ $750) price tag. 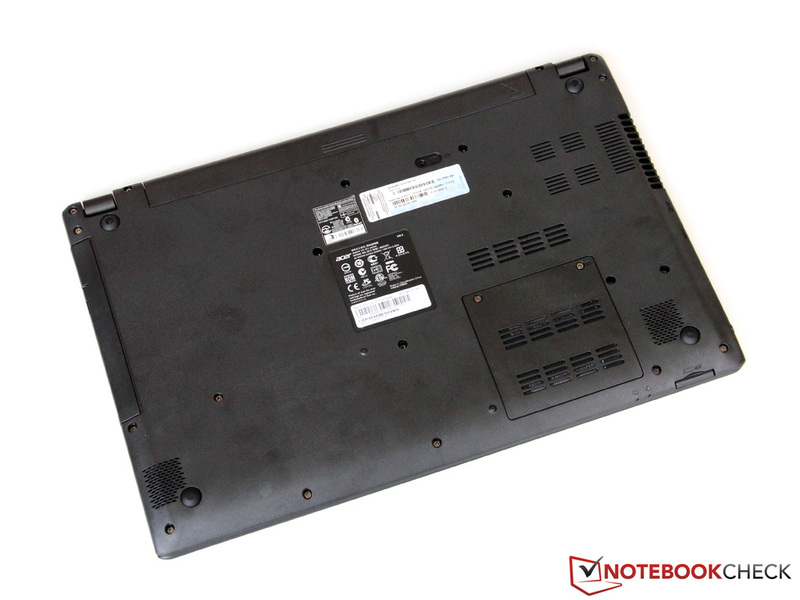 This 15-inch notebook also makes use of a ULV (ultra low voltage) Intel processor. 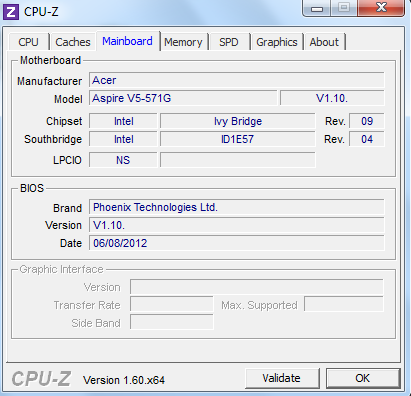 Instead of an economy model, this notebook uses the more powerful Ivy Bridge Core i5-3317U dual-core processor. Gaming fans will be pleased with the addition of a dedicated Nvidia GeForce GT 620M video card. The system configuration is rounded out by 4 GB of RAM and a 500 GB hard disk. Acer is one of the first major manufacturers to offer this self-proclaimed “ultra-slim” class of notebooks using large, 15.6-inch displays. 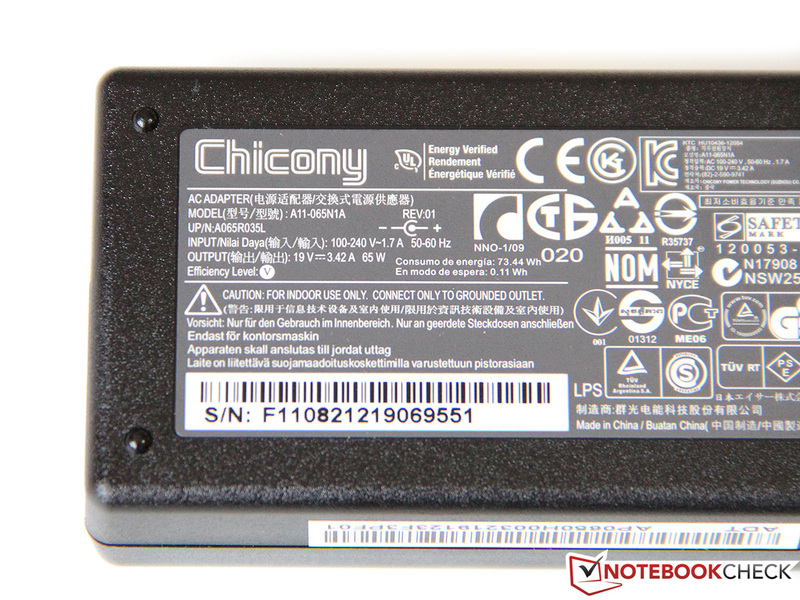 Only a handful of competing notebooks, such as the Samsung 900X4C, even exist. However, these competitors are almost always in a much higher price bracket. 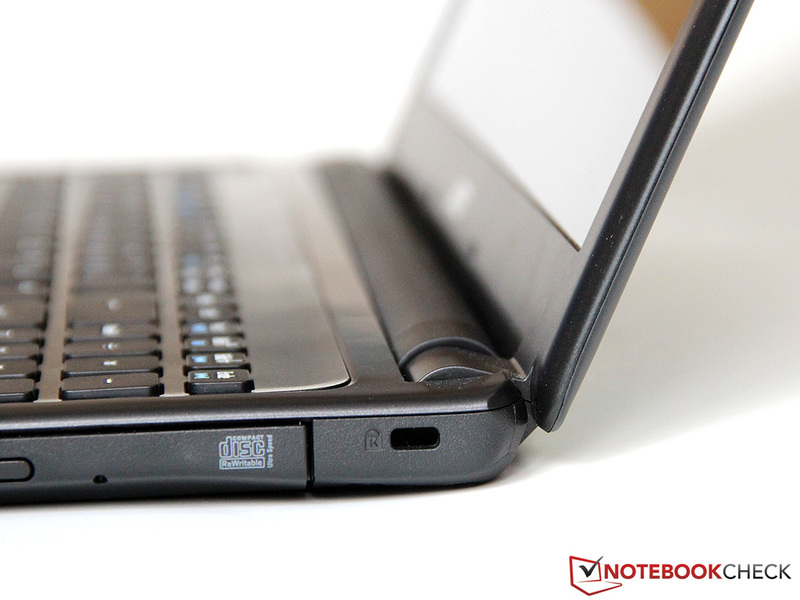 As a result, the Aspire V5 series will be seen primarily as a slim alternative to classic multimedia laptops. Will this qualify the notebook for our recommendation? Find the answer to this question and more in our review. 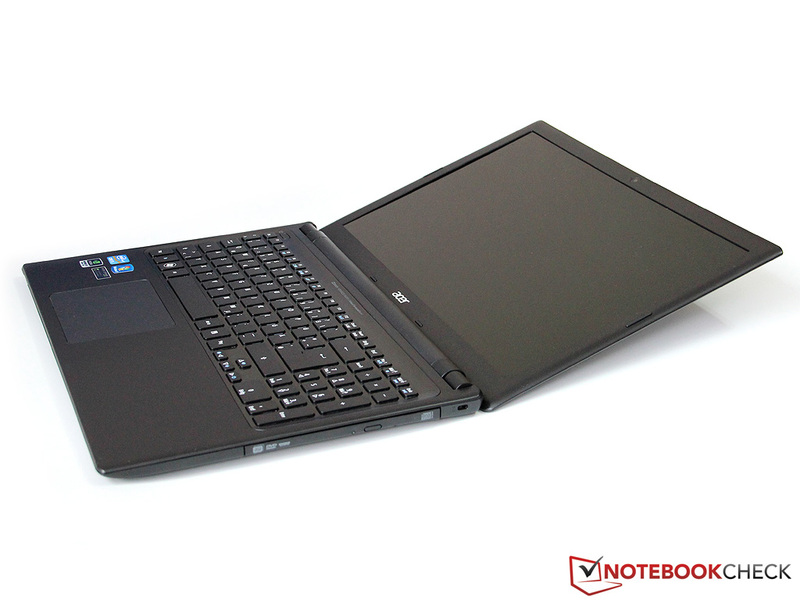 One of the primary factors behind the generally-high price points of current ultrabooks is the use of expensive, high-grade construction materials for the case. 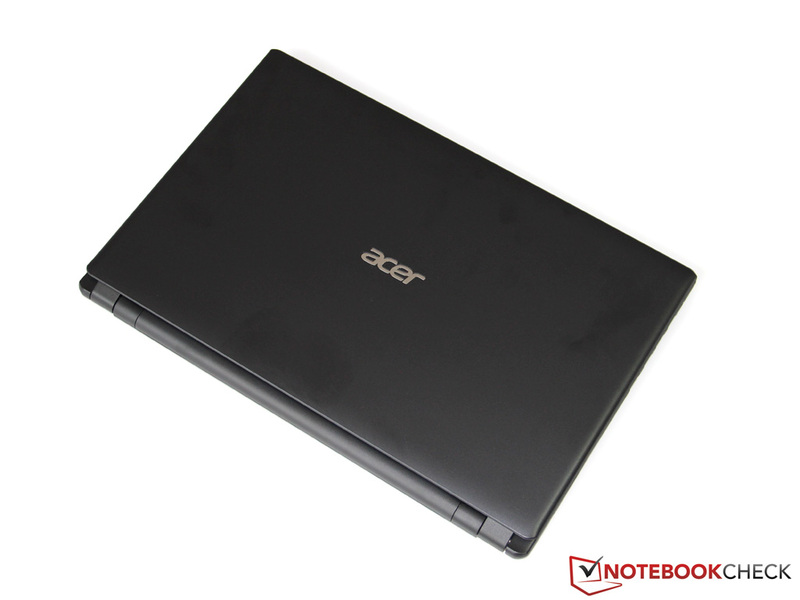 To circumvent this premium, Acer instead uses a simple but nonetheless appealing plastic case for the Aspire V5-571G. The black, matte finish found on all surfaces further increases the utility of the case by reducing the visibility of fingerprints even if it falls short of doing the same for dust. Compared to other 15-inch devices, it weighs only 2.3 kilograms (5.1 pounds) as opposed to the 2.5 to 2.8 kilograms (5.5 to 6.2 pounds) that is typical for this class. Moreover, the 23-millimeter (0.91-inch) thickness stands out at first glance. 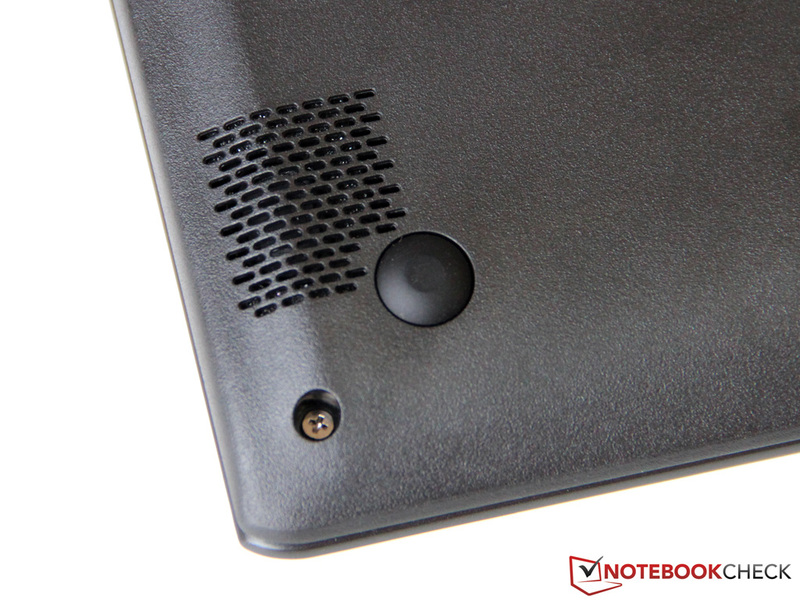 Despite its considerable footprint, the notebook appears easily manageable and portable due to this slim build. Had the 2-centimeter (0.79-inch) display bezel been a bit narrower, an even more compact exterior could have been possible. 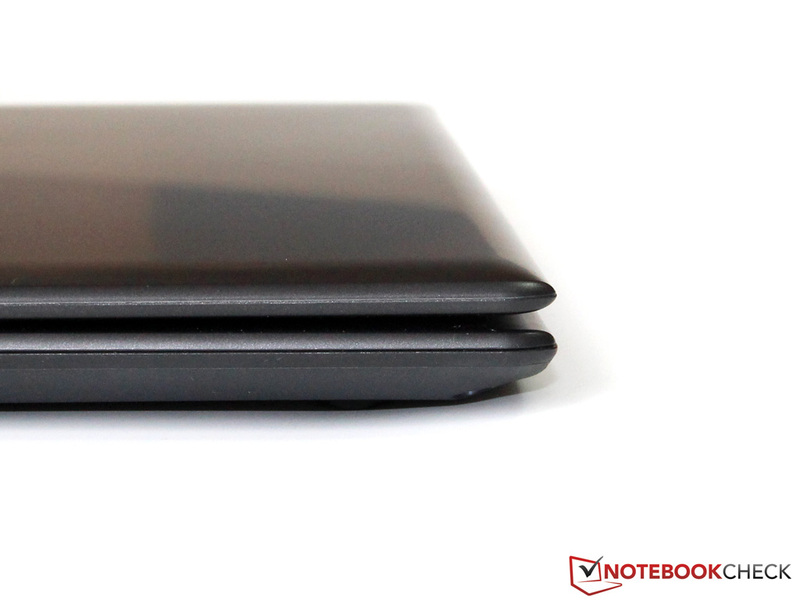 While many ultra-slim notebooks suffer from stability issues, some seem to do worse than others. In our testing, we observed that the case of our Aspire V5-571G depressed slightly in the areas around the optical drive and below the keyboard under strong pressure. Nonetheless, the base unit appeared relatively robust. However, flaws in workmanship gave reason for criticism. Our test sample showed a large gap between two plastic parts at the front and required us to properly set the two pieces together. While this could be an isolated incident, we also observed shortcomings in other areas such as the generally uneven material transitions. Despite its rather stiff hinges, the display lid can be opened with one hand albeit with a tendency to rock back and forth momentarily after doing so. Even without expensive magnesium or carbon fiber reinforcement, the display lid proved to be quite solid with only marginal twisting. Overall, we consider the build quality to be acceptable but otherwise uninspiring given the price. 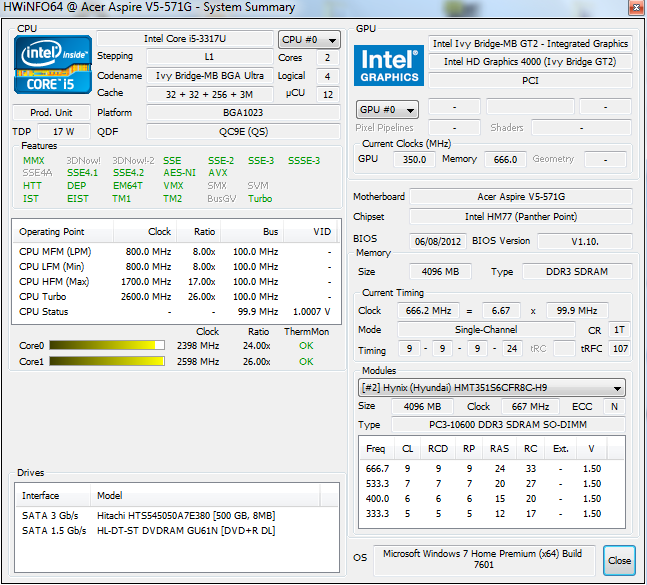 At this point in 2012, the faster USB 3.0 specification has become a standard feature even on cheaper notebooks. As such, it is only natural that the Aspire V5-571G also offers such a port. It is accompanied by an additional two USB 2.0 ports and should be sufficient for most users. Next to the HDMI port is an elongated, proprietary socket which provides Gigabit Ethernet and VGA output via an included adapter. While we would have appreciated DisplayPort and Thunderbolt interfaces, the latter is found almost exclusively on Apple MacBooks and the Aspire V5-571G has neither. Apart from the 2-in-1 card reader on the front, all other interfaces are located on the left side. This leads to two possible restrictions. Firstly, left-handed users will likely have a difficult time keeping cables and connected devices out of the work area. Secondly, the spacing around the individual ports is rather tight and will create problems with wider USB connectors. Acer could have avoided these problems by placing some of the ports on the rear instead. The Acer V5-571G features the Qualcomm Atheros AR5BWB222 Wi-Fi module which supports the 802.11b/g/n wireless standards. Limited to the 2.4 GHz band, the module is capable of delivering wireless transfer speeds of up to 150 Mbit/s. The Wi-Fi module also includes Bluetooth 4.0 support, allowing the notebook to connect wirelessly to various peripherals including smartphones and headsets. 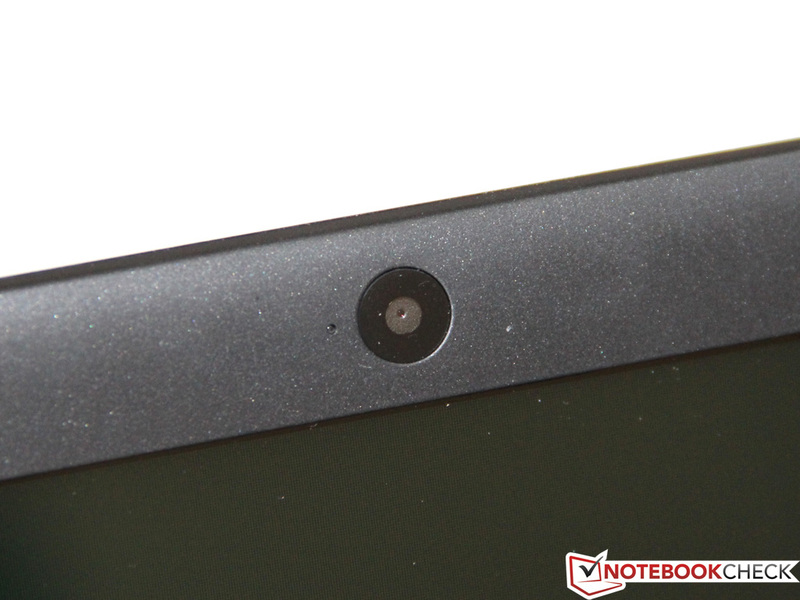 The 1.3-megapixel webcam was a pleasant surprise as it provided comparatively sharp and detailed images by notebook standards, even though a low level of noise was also detected. However, the built-in microphone delivered a much less convincing performance as high frequencies suffered from a faint ringing and recordings generally sounded hollow and unnatural. 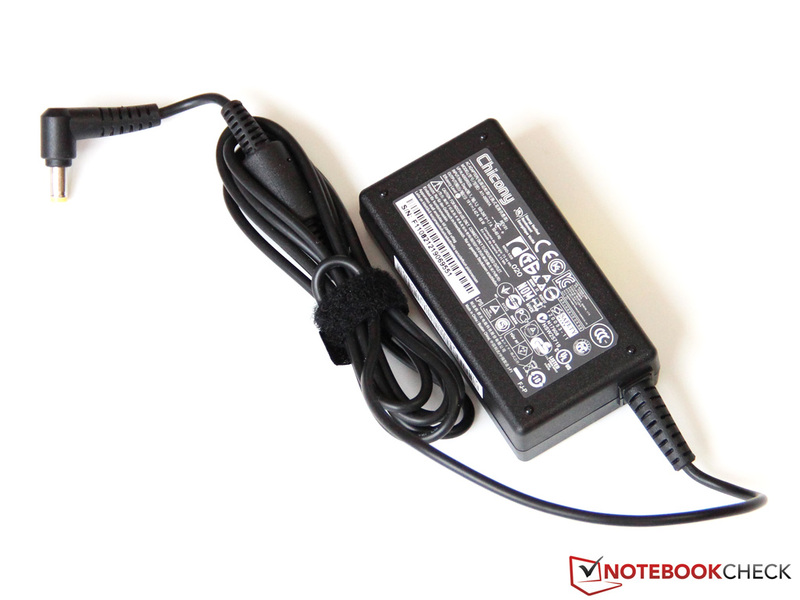 The Aspire V5-571G’s retail package includes the notebook, its battery, and a 65-Watt power adapter. A few brochures and warranty papers are the only additional contents. Recovery media would be desirable but as they are not included, it remains up to the user to create their own. The notebook also includes a number of pre-installed services and applications, some of which are useful and others which are not. Among the handy tools is the Acer Backup Manager that can automatically create backups of files or the whole partition in a single image. Other programs, such as McAfee Internet Security Suite, are provided as trial versions and their recurring activation reminders can quickly become a nuisance. As usual, the underside houses a cover that allows access to the internal components. However, after removing the two screws and carefully removing the cover, it quickly becomes clear that the Aspire V5-571G does not offer many options in terms of upgrades. Without further disassembly of the case, the user can only access the two memory slots, one of which is unoccupied. Users wishing to clean the fan or change the hard drive will risk voiding their warranty. 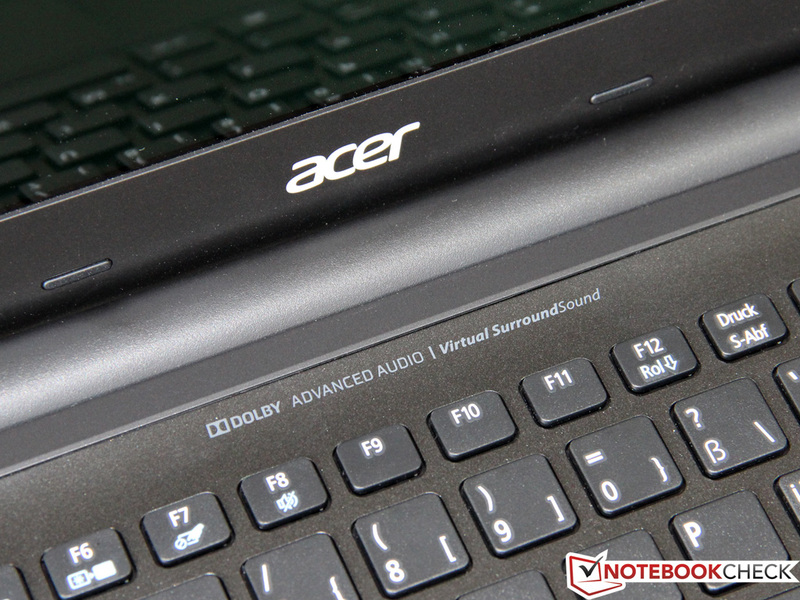 Diverging from a trend followed by many of its competitors, Acer offers a 24-month manufacturer’s warranty on the Aspire V5-571G. This warranty can be extended through one of several warranty packs sold by online retailers under the marketing name “Acer Advantage”. Extending the warranty to a three-year term starts at around 80 Euro (~ $100). 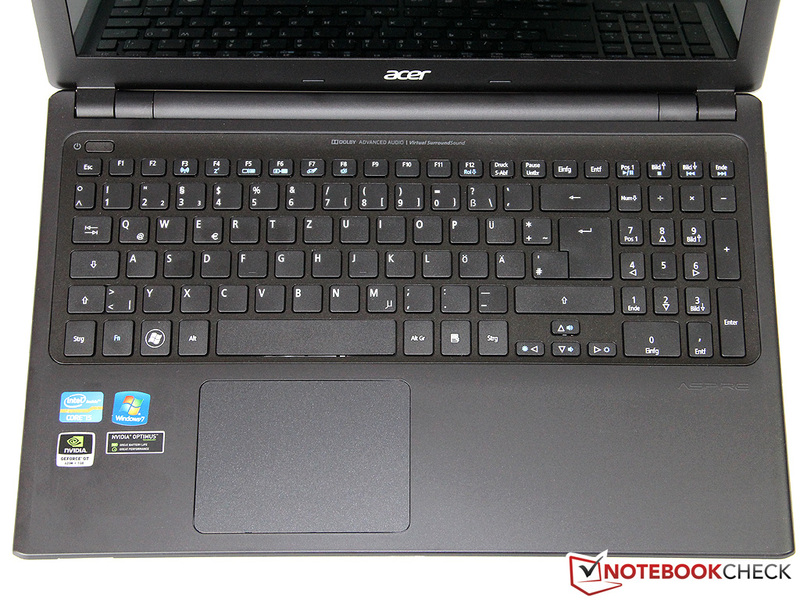 For the Aspire V5-571G, Acer used almost the entire width of the notebook for a full-sized chiclet keyboard complete with number pad. The 15 x 15 millimeter (0.59 x 0.59 inch) keys are made from a black plastic that does not seem to be of a particularly high quality. On the other hand, we had no complaints regarding the stability and workmanship of the keyboard. All keys are cleanly fitted and firmly attached. The placement of the “<>|” and the “#” next to each other on the German keyboard layout is slightly odd but the layout otherwise conforms to the standard layout. 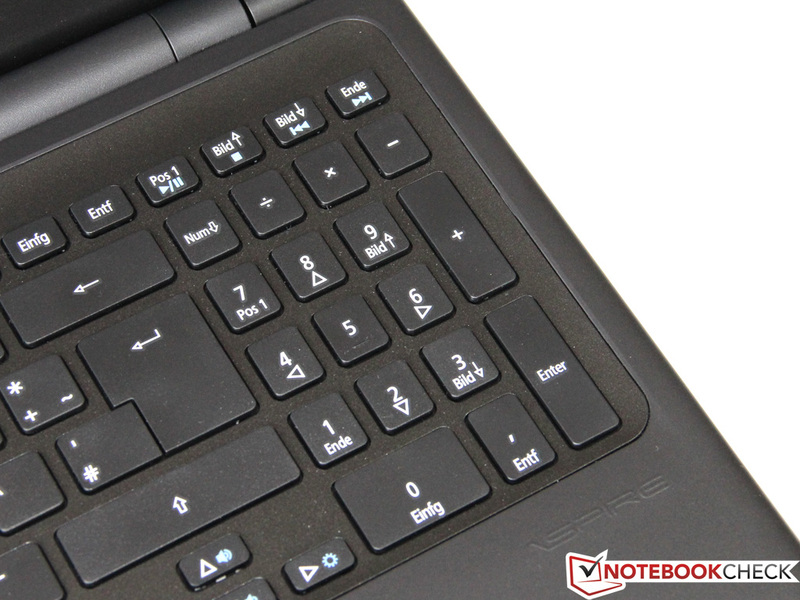 Acer appears to have responded to previous criticism of their notebook’s input devices and the Aspire V5-571G definitely surprised us with a pleasantly comfortable typing experience. While the tactile feedback was a bit on the soft side, it proved to be precise and uniform across the entire keyboard. The keys have a very low travel and emit only minimal noise even when our fingers were hammering away at the keyboard. This trait qualifies the notebook for use in quieter working environments. Our only suggestion for improving the keyboard would be to use slightly more concave keys, allowing fingers to hit key-centers more intuitively and improve typing feedback. 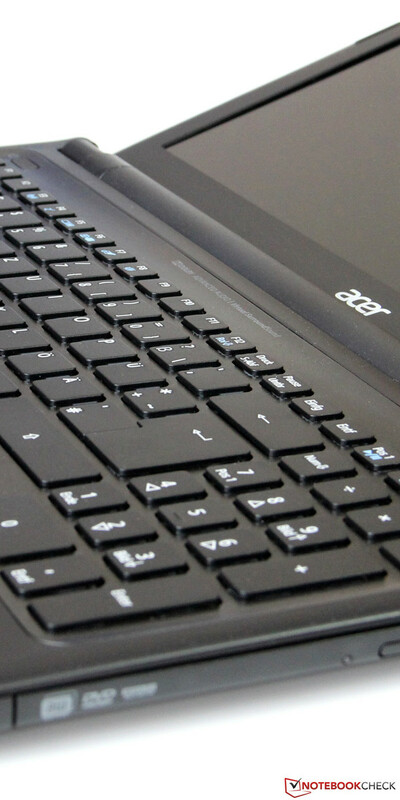 The Aspire V5-571G uses a Synaptics touchpad located on the left half of the wrist rest. The touch surface has dimensions of 10.5 x 7.8 centimeters (4.1 x 3.1 inches) and supports modern multi-touch features such as pinch-to-zoom. The touchpad also includes palm detection, a feature dubbed “smart sense”, which is designed to prevent unintended input. 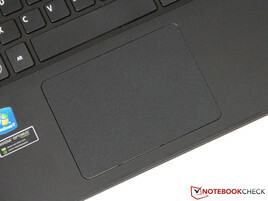 The smooth touchpad achieved high scores in terms of precision and ease of movement, provided the user’s hands are dry. 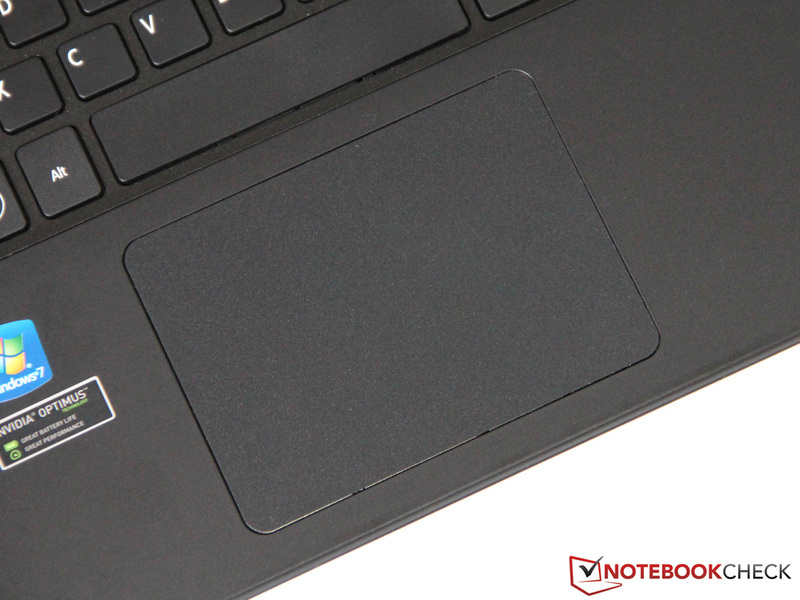 The Aspire line follows the current trend of integrating the mouse buttons into the touchpad itself. While clicks are meant to be detected only on the lower edge, the firm buttons can be activated on almost the entire surface if sufficient force is applied. We are not entirely happy with this particular solution and would have preferred a classic-style touchpad with dedicated buttons. 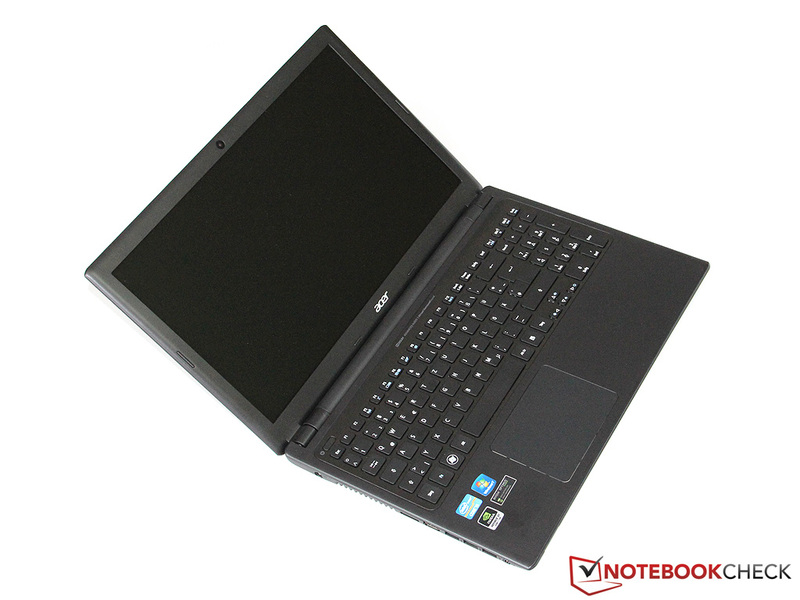 The Aspire V5-571G uses a 15.6-inch 1366x768 AUO TN display (model number B156XW04 V5). The resulting pixel density of 100 dpi is nothing spectacular in the current market where Apple’s new Retina display is carrying headlines and inspiring imitation. To be fair, we do not hold this against Acer as higher resolutions are not standard for devices in the same price range as the Aspire V5-571G. On the other hand, we are a bit concerned with the poor measured brightness of 178 cd/m2. While the brightness was evenly distributed across the entire display, this is only slightly above what is necessary for use under normal indoor lighting conditions. 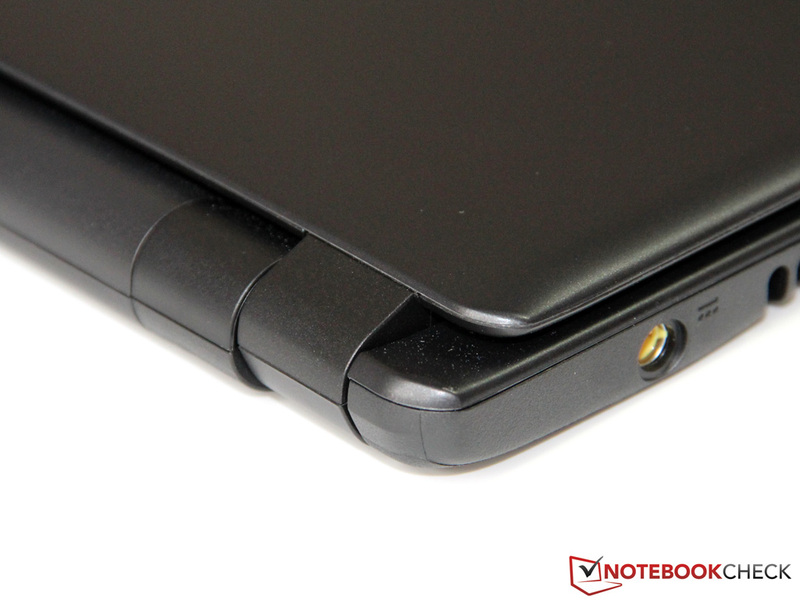 While some competitors also have similar weaknesses, this limitation represents a particularly burdensome restriction for an ultra-slim notebook designed for portability. 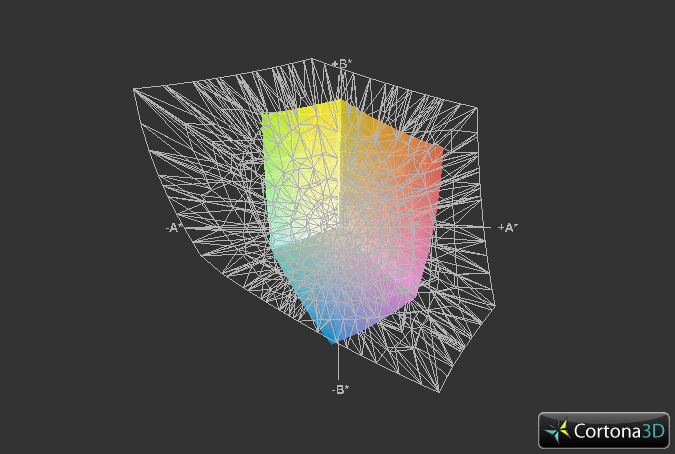 We also measured a rather bad black value of 0.97 cd/m2 which results in a low contrast ratio of 193:1. While this is not necessarily worse than some competitors, more expensive alternatives such as the Dell XPS 15, whose successor will be reviewed shortly, managed to achieve much higher contrast ratios in the range of 500:1 to 1000:1. These higher contrasts lead to more realistic rendering of images, particularly in movies and games. Of lesser importance is the display’s limited color space which fell short of covering both the sRGB and AdobeRGB color space standards. 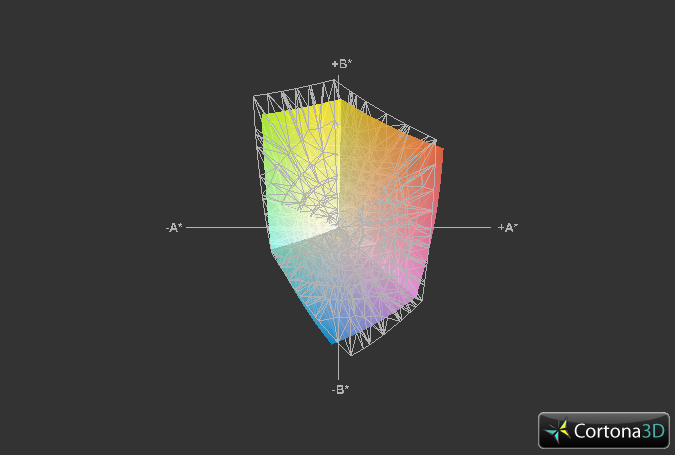 Color space is an issue relevant first and foremost to graphics professionals who frequently work with graphics and photo editing software. Other users are unlikely to notice this shortcoming in everyday use, especially considering the glossy display which allows colors to appear vivid and lively. However, this glossy glare-type display proved to be a disadvantage in outdoor use. Under direct sunlight, the screen was overwhelmed by strong reflections and displayed text and images were completely illegible. In order to use the device in such conditions, a matte display with a brightness of at least 250 to 300 cd/m2 would be required. Frequent readers will also be aware of another weakness of TN-based displays – narrow viewing angles. 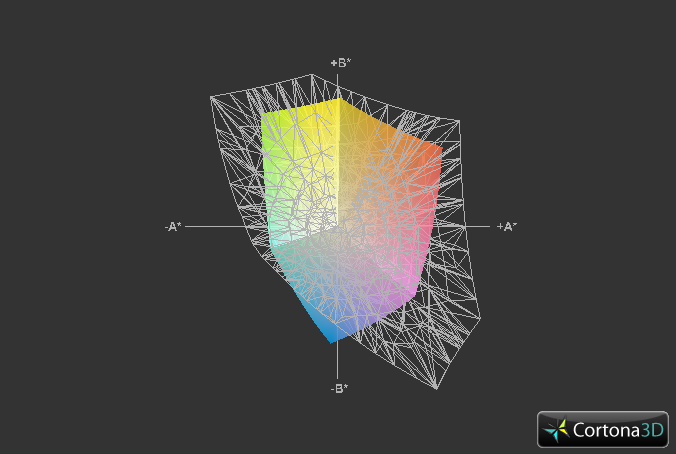 The display’s contents change dramatically when one views the display at an angle, especially when viewed diagonally from above or below the head-on viewing angle. Fortunately, the display offered a little more generosity when viewed from the side. 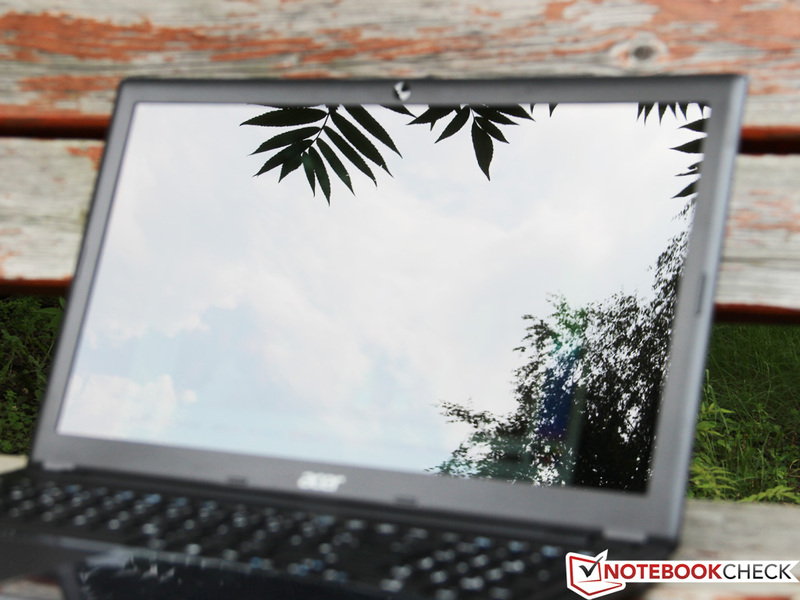 Nonetheless, better results require the use of VA or IPS displays found in most tablets and some higher-end notebooks such as the Asus Zenbook UX32VD. As previously mentioned, the Aspire V5-571G is equipped with both HDMI and VGA output, the latter requiring the use of the included adapter. 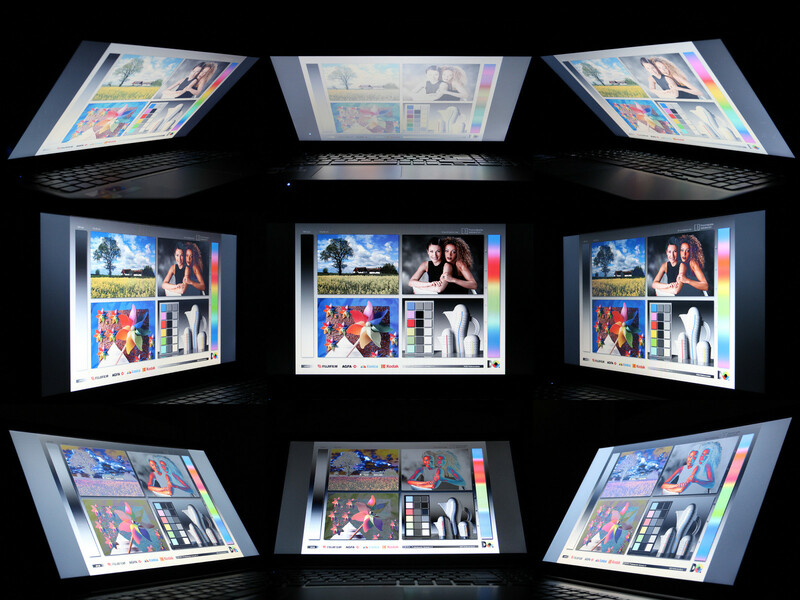 Even in 1920x1080 Full HD, the notebook is capable of exporting an excellent signal quality and the output showed both high sharpness and minimal jitter. Modern processors have reached a level of performance where even mid-range processors are barely challenged by most day-to-day applications. Using this potential, Acer equipped the Aspire V5-571G with a power-saving ULV processor that sacrifices a bit of processing power for a comparable reduction in power consumption. The Aspire V5-571G is available with Sandy Bridge Pentium and Core i3 processors as well as the Ivy Bridge Core i5-3317U found in our test device. The 22-nanometer fabrication processor allows the 1.7 GHz dual-core CPU, with a Turbo Boost speed of 2.6 GHz, to have a very low 17-Watt TDP (thermal design power). 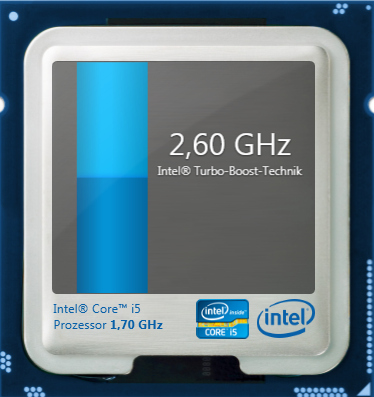 This low consumption places the processor at the front of the line for use in ultra-slim notebooks and ultrabooks. 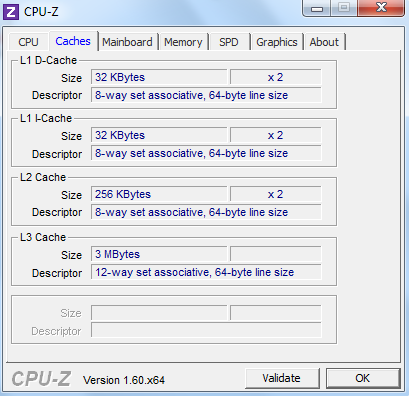 Similar to processors from the i7 family, the Core i5-3317U supports features such as Hyper Threading, AES-NI, and AVX but does so with a smaller 3 MB L3 cache as opposed to the 4 MB L3 cache found in the Core i7-3517U. While cheaper configurations of the Aspire V5 series are limited to the CPU-integrated HD Graphics 4000, our top-of-the-line model includes a dedicated Nvidia GeForce GT 620M. 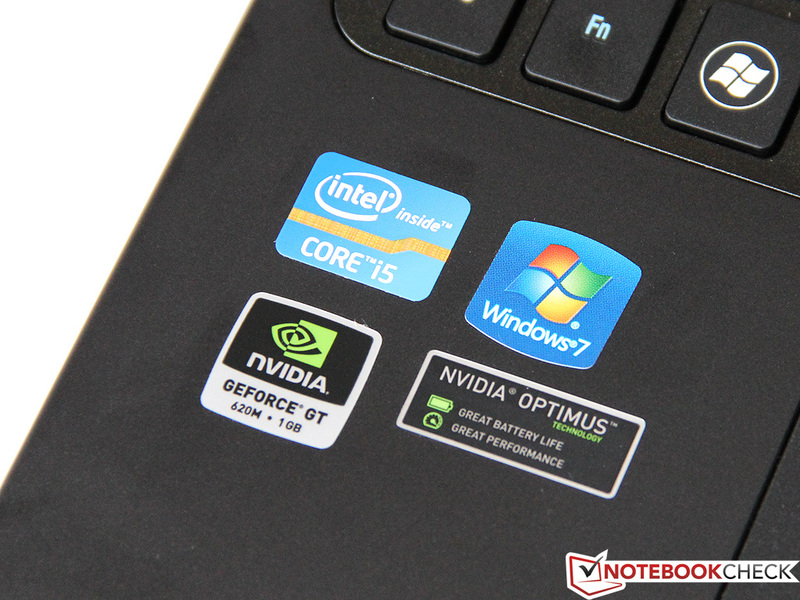 The notebook makes use of Nvidia Optimus technology to switch between both the integrated and dedicated graphics cards automatically to extend battery life during low-performance scenarios. It should be noted that the GT 620M represents the bottom of mid-range graphics cards and cannot transform the Aspire V5-571G into a full-fledged gaming machine. The configuration is rounded out by 4 GB of RAM and a 500 GB hard drive. As Acer chose to use a single DDR3-1333 module, the memory interface only operates in single-channel mode and results in a greatly reduced memory bandwidth compared to the optional dual-channel DDR3-1600 setup. However, this is unlikely to cause significant performance losses as the integrated GPU managed a score of 539 points in 3DMark11 representing a reduction of approximately 10 percent. 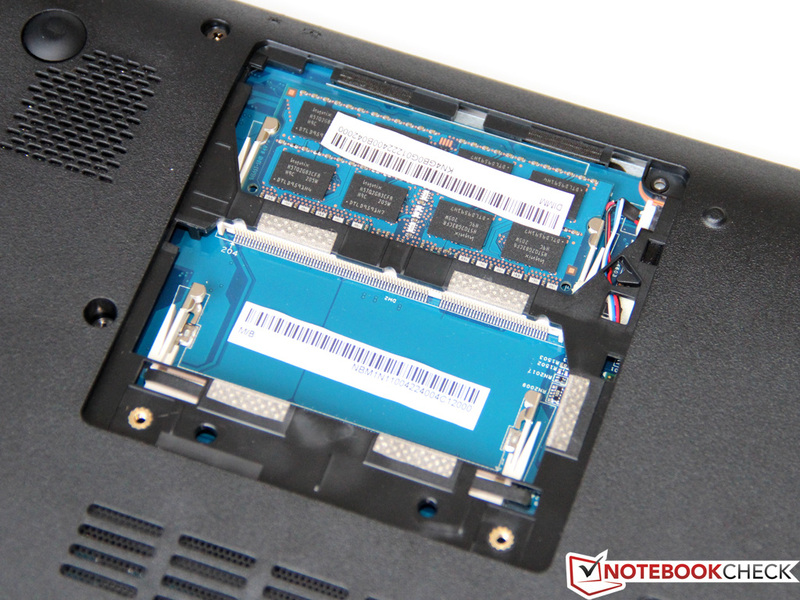 Those considering the purchase of an Aspire V5 without a dedicated graphics card would be well-advised to upgrade the notebook to include an additional RAM module. The most important factor in determining the overall performance of current CPUs is whether they are capable of fully exploiting Turbo Boost. In the case of our Aspire V5-571G, we can confirm that Turbo Boost was fully utilized and our benchmark results were almost identical to similarly equipped notebooks such as the Dell Vostro 3360. In the Cinebench R11.5 64-bit multi-core test, our system managed a good score of 2.38 points with the processor running at a constant 2.4 GHz clock speed. During the Cinebench R10 64-bit single-core test, the Core i5-3317U managed to score 4287 points while operating at 2.6 GHz. Direct comparisons to other CPUs in this and many other benchmarks can be found in our benchmark database. 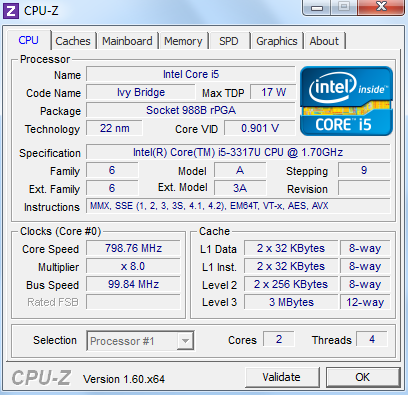 Compared to the previous Sandy Bridge Core i5-2467M, the 20 to 25 percent improvement of the Core i5-3317U is immediately noticeable. These results place the ULV processor within reach of several older 35-Watt CPUs, an ultimately good result for a power-efficient model. The entire Aspire V5 series can only be configured using conventional hard disks in either 320 or 500 GB sizes. 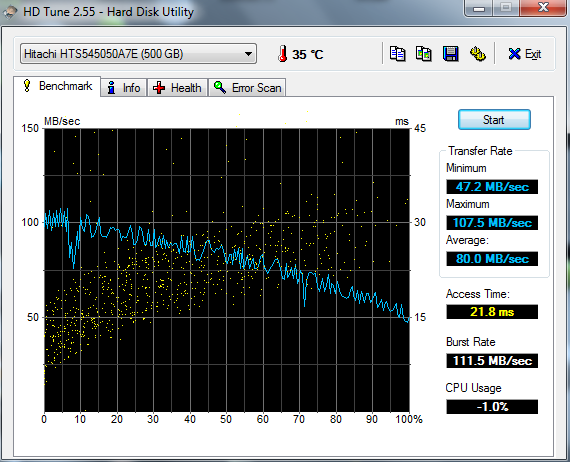 Our test sample included the larger of the two drives, the 500 GB 5400 RPM Hitachi Travelstar ZK500. This drive features an 8 MB cache and is one of the slower drives in its class. This is somewhat compensated by slim 7-mm (0.28-in) thickness compared to the 9.5-mm (0.37-in) thickness of common notebook drives. The fact that Hitachi was able to create a drive with a 500 GB capacity on a single platter points toward a comparatively high data density. This enables the drive to reach decent transfer rates despite its low rotational speed. We measured an average data transfer rate of 80 MB/s in HD Tune, a result that we consider decent. On the other hand, the 21.8-millisecond access time is a bit weaker. Drives with a 7200 RPM speed certainly have an advantage in this regard. 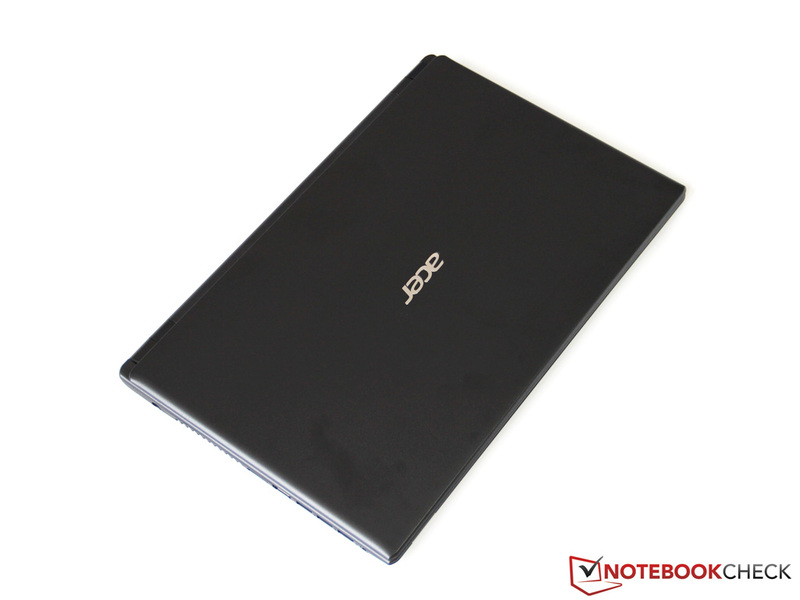 The processor and hard disk are the primary determining factors of a given notebook’s PCMark scores. 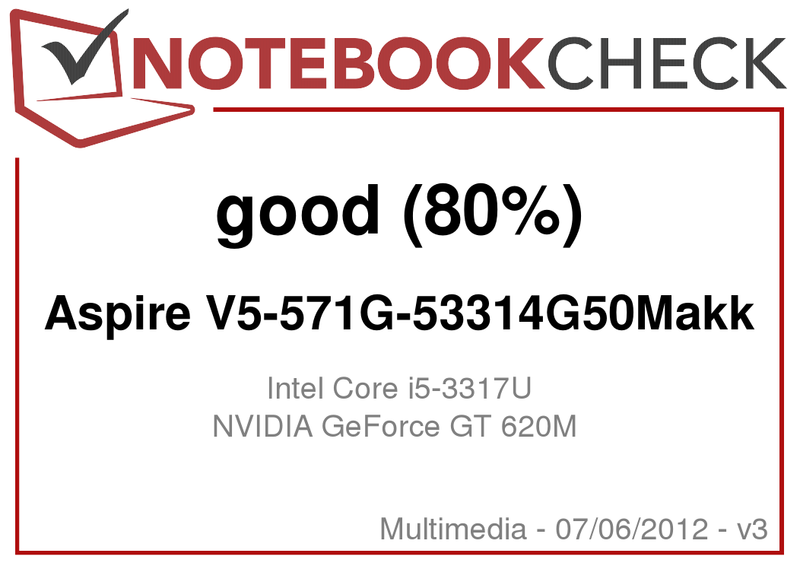 Our sample Aspire V5-571G managed 5942 points and 1858 points in PCMark Vantage and PCMark 7 respectively, results that are comparable to some faster office notebooks such as the Asus U56E. An SSD hard drive would boost not only synthetic benchmarks but also everyday responsiveness. While the CPU rarely left us wanting, the slower storage drive resulted in noticeably slower boot times and application start times. Those seeking to replace the hard drive with an SSD model will need to remember to choose a model that fits the 7-millimeter (0.28-inch) thickness of the hard disk it replaces. The Aspire V5-571G includes the Nvidia GeForce GT 620M, the little brother of the Nvidia GeForce GT 630M. Both of the aforementioned cards use the older Fermi architecture and feature 96 shader units but differ in terms of clock speed and memory bandwidth. By comparison, the Nvidia GeForce GT 640M and Nvidia GeForce GT 650M use the newer Kepler architecture. However, it should be noted that there are two variants of the GT 620M. The first of these uses the GF108 graphics chip based on the 40-nanometer Fermi process. The second of these uses the GF117 graphics chip based on the 28-nanometer Kepler process. 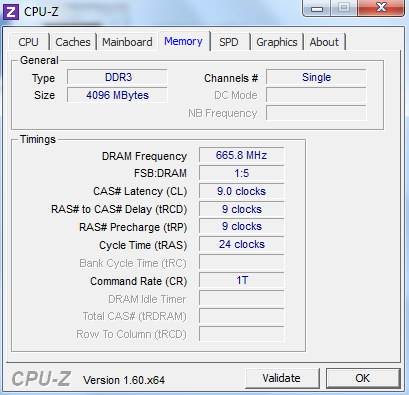 The latter is characterized by a 64-bit memory interface and 1 GB DDR3 VRAM operating on a 900 MHz memory clock. We believe the Aspire V5-571G uses the Kepler-based variant and we observed a base core clock of 625 MHz and a Turbo mode clock of 715 MHz. Both of these are overclocked when compared to the Nvidia reference specification. Despite its much lower memory bandwidth, this core clock speed allows the GT 620M to be a threat to the older Nvidia GeForce GT 540M. The GT 620M achieved a score of 1145 points in 3DMark11, approximately twice the score of the processor-integrated HD Graphics 4000. Compared to the GT 630M, this result is within 10 percent. Only the Kepler-based GT 640M and GT 650M demonstrated significant differences with performance gains of 50 and 100 percent. The previously mentioned synthetic 3DMark benchmark results were reflected in our real-world gaming tests. 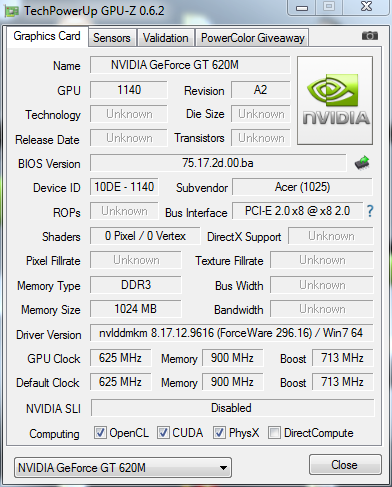 The Nvidia GeForce GT 620M came in slightly behind the Nvidia GeForce GT 630M and slightly ahead of the AMD Radeon HD 7670M. 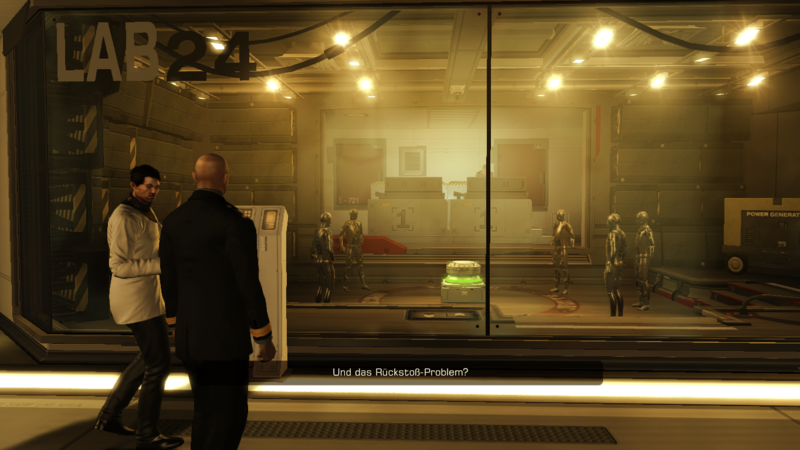 In less demanding games such as Deus Ex: Human Revolution and Diablo 3, the GT 620M was sufficient to play at the display’s native 1366x768 resolution without stuttering in high details and with anti-aliasing enabled. Fifa 12 was playable even in Full HD on an external display but this is the exception rather than the rule among modern games. Games such as Anno 2070 and Alan Wake place higher demands on graphical performance and our test device was only able to fluidly play these games using reduced settings. Generally speaking, the notebook was capable of over 30 fps in most games, albeit often at a reduced 1024x768 resolution. 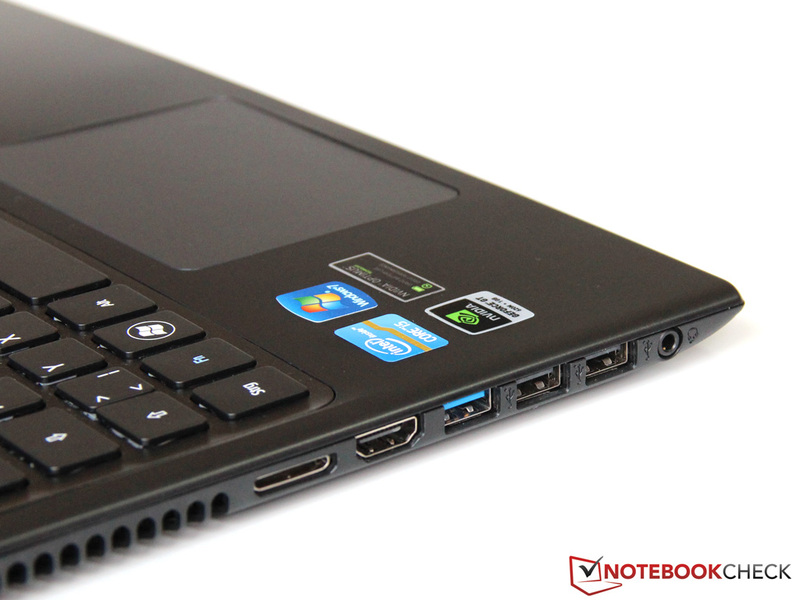 For a lightweight multimedia notebook that is only occasionally used for games, the GT 620M appears to be a fitting choice. The Aspire V5-571G represents an interesting situation. On the one hand, ultra-low voltage hardware generates less heat. On the other hand, the extremely thin case has little room for cooling. What does this combination entail in terms system noise? While idle, we found the system noise to be mostly quiet. Simple tasks such as word processing and light Web browsing could be performed without triggering the automatic fan. 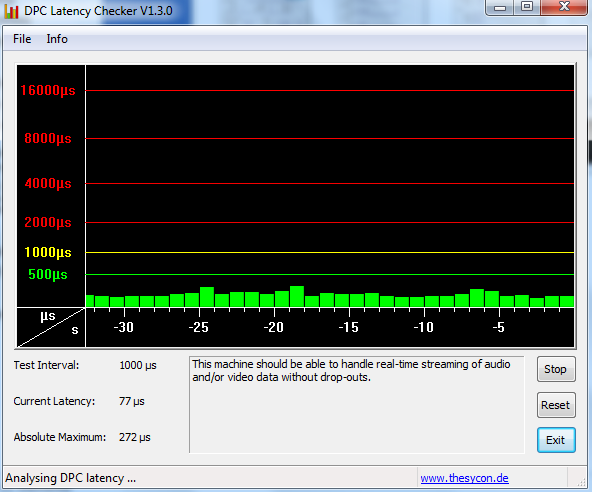 In this case, the only noise was the quiet 29.6 dB(A) hum of the hard disk. Even when the small fan was active, the noise level was an unobtrusive 32.4 dB(A). During higher loads, such as playing a 3D game, the noise level rose progressively to a maximum of 37.4 dB(A). While this is not particularly loud, per se, the high-pitched noise could become a nuisance after a while. In the worst-case scenario – our Prime95 and FurMark stress test – we were able to measure a noise level up to 40.9 dB(A). It should be noted that such high noise levels are unlikely to ever be reached in practical use. These results allow us to state that there is still room for improvement in terms of system noise based on the results of the equally-slim Asus U56E. The previously mentioned noise levels are only meaningful in the context of system temperature. We measured a temperature of 32°C (90°F) on both the top and underside of the case while the system was idle, possibly as a result of the warm season and correspondingly high outdoor temperature of 26°C (79°F). Under load, these temperatures rose to an average of 36°C (97°F) with hotspots clustered around the air vents on the left side. Considering the differential between these measurements and the ambient room temperature at the time of our test, the Aspire V5-571G’s cooling system performed fairly well. Internally, the processor temperature was just under 90°C (194°F) but the CPU managed to sustain its maximum Turbo Boost clock of 2.4 GHz. The same was also true for the graphics card which consistently operated at 715 MHz and only reached a temperature of 73°C (163°F). Given the external conditions at the time of the test, we have nothing but praise for Acer in terms of temperature management. In this category, they did everything right. (+) In idle usage, the average temperature for the upper side is 31.8 °C / 89 F, compared to the device average of 30.9 °C / 88 F.
(-) The average temperature of the palmrest area of similar devices was 29.1 °C / 84.4 F (-8 °C / -14.4 F). The Aspire V5-571G comes with two stickers on the case that proudly advertise “Dolby Advanced Audio” and “Virtual Surround Sound”. Do these technologies provide decent sound quality? Unfortunately, the answer is no. The two stereo speakers, hidden on the underside, did not deliver a convincing performance. Bass was present, albeit very weakly. As well, treble was overly accentuated. The result was a slightly rattling sound that suited neither music nor movies particularly well. On the bright side, the maximum volume was sufficient to fill even medium-sized rooms adequately. Nonetheless, we are inclined to recommend the use of external speakers via the 3.5 mm audio jack or HDMI if possible. 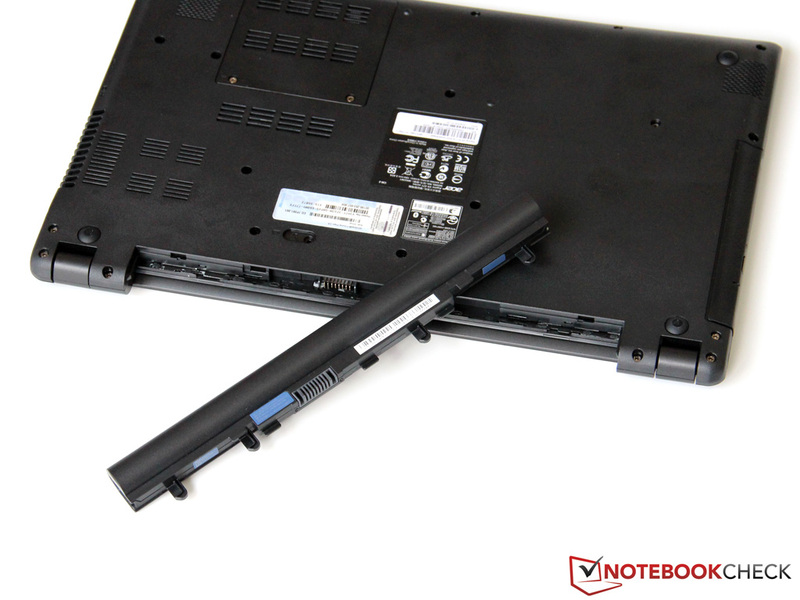 The Aspire V5-571G’s combination of sophisticated power-saving hardware and Nvidia Optimus technology allows the ultra-slim notebook to be frugal in terms of power consumption. We measured an idle consumption level of 6.6 to 10.2 Watts. While only marginally more than most ultrabooks, this falls short of distinguishing the Aspire V5-571G from other 15-inch notebooks, such as the Lenovo ThinkPad Edge E520, which reach similar results. 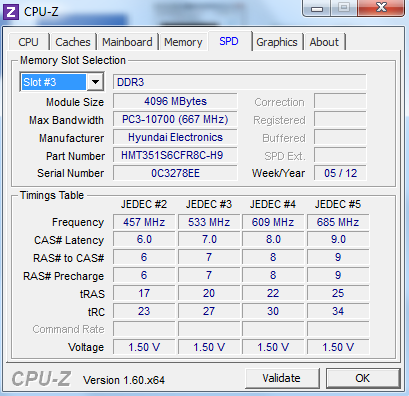 Under load, the ULV processor and economical 28-nanometer GPU did their parts to keep power consumption under control. 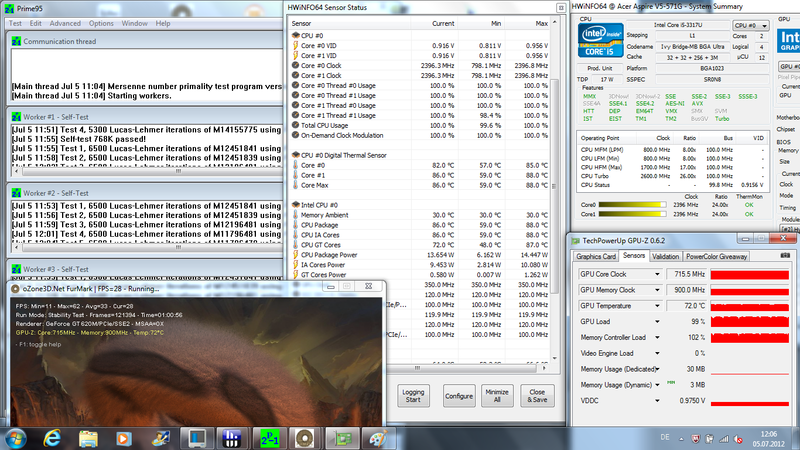 While running 3DMark06, the notebook consumed 42.1 Watts. During our simultaneous Prime95 and FurMark stress test, power consumption rose to 49.5 Watts. In both cases, the 65-Watt power adapter was more than sufficient. 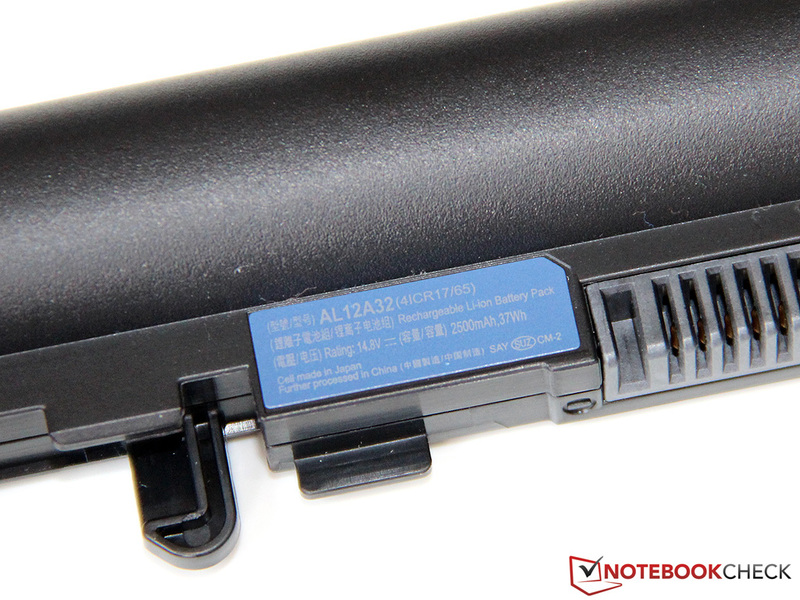 This low power consumption should allow the Aspire V5-571G to excel in terms of battery life. Unfortunately, this is hardly the case as Acer has been rather miserly by equipping the notebook with a small 37-Wh battery which negates the potential for longer battery runtime. In the Battery Eater Reader’s Test, the notebook only managed 5 hours 34 minutes using the Power Saver profile, minimum display brightness, and disabled wireless modules. With the Wi-Fi module enabled and the display brightness set to 150 cd/m2, we achieved a runtime of 3 hours 15 minutes. By comparison, the Asus U56E with its high-capacity 74-Wh battery managed over 7 hours in the same scenario. To determine minimum battery life, we used the Battery Eater Classic Test. Using the High Performance profile, wireless modules enabled, and maximum display brightness, the battery was drained after 92 minutes. A full recharge took approximately 3 hours. 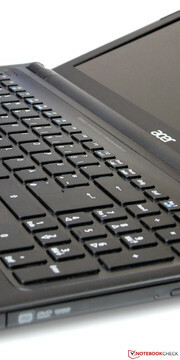 The Acer Aspire V5-571G allows the manufacturer to fill a gap in the market. The unique combination of 15-inch form factor, ULV-hardware, and sub-600 Euro (~ $750) price makes the notebook an interesting alternative to similar models such as the Asus U56E. The use of both the Core i5-3317U and GeForce GT 620M provides a sound basis for decent power and moderate power consumption. Most current 3D games ran smoothly even though the Aspire V5-571G lacks the overhead of a more powerful gaming notebook. The sleek ultra-slim design also houses other integrated assets such as Bluetooth 4.0. While the fact that the case is made from plastic rather than metal is not of significant concern to us, the flaws in workmanship found in our test sample certainly do. The highly reflective, low-brightness display and the relatively tiny battery remain our primary criticisms. As a result of the above, the notebook seems unsuitable for mobile use. This certainly raises a question as to whom the Aspire V5-571G is targeted. Those working from home or office are likely better off with the Aspire V3 Series. While it may be somewhat heavier and bulkier, it offers a better overall package for the same price. overall typing comfort is convincing. did not quite live up to its promise. and offers a good compromise between economy and performance. The notebook is not particularly user upgradable. Only the RAM is accessible through the removable cover. and the 37-Wh battery is clearly to blame here. as do the decent input devices. 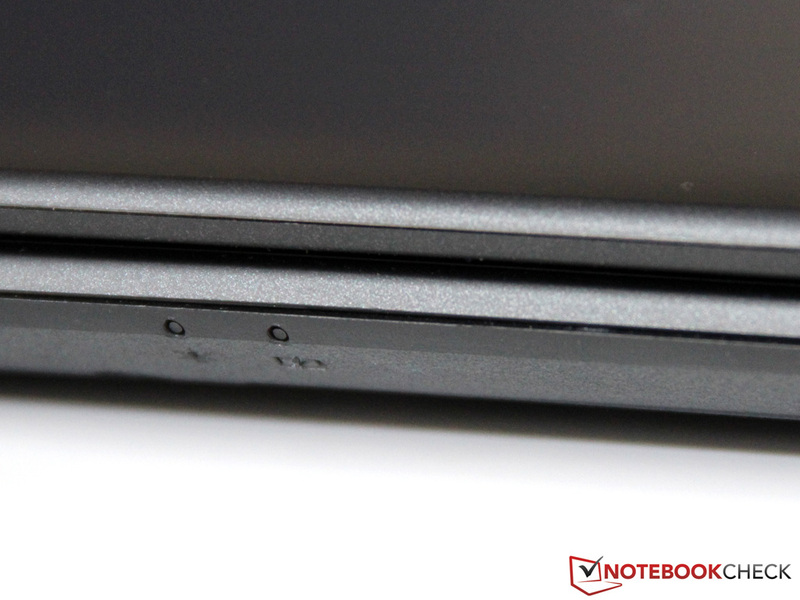 while on the other, we see the features of a thin ultrabook. is reflected in the questionable workmanship. and offers a generous opening angle. Up to 170° is possible. Under a clear sky, the screen suffers from bright reflections. The Aspire V5's attractively compact dimensions are not its only strong point, it also offers a decent performance for a reasonable price. Without a matte and sufficiently bright display, there is no chance of outdoor usage. The decision to supply a comparatively tiny 37-Wh battery further restricts mobility. The power efficiency of the notebook is remarkable. In particular, the power consumption under load of less than 50 Watts demonstrates the impressive efficiency gains made possible by the modern manufacturing processes of the CPU and the graphics card. There is currently no direct competitor. 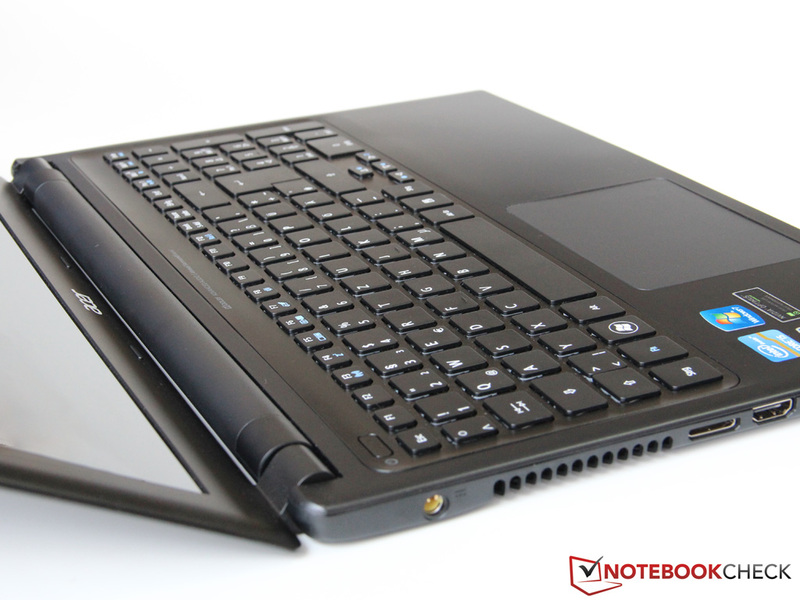 The Aspire V5-571G can be considered a larger alternative to sub-notebooks like the Dell Vostro 3360. 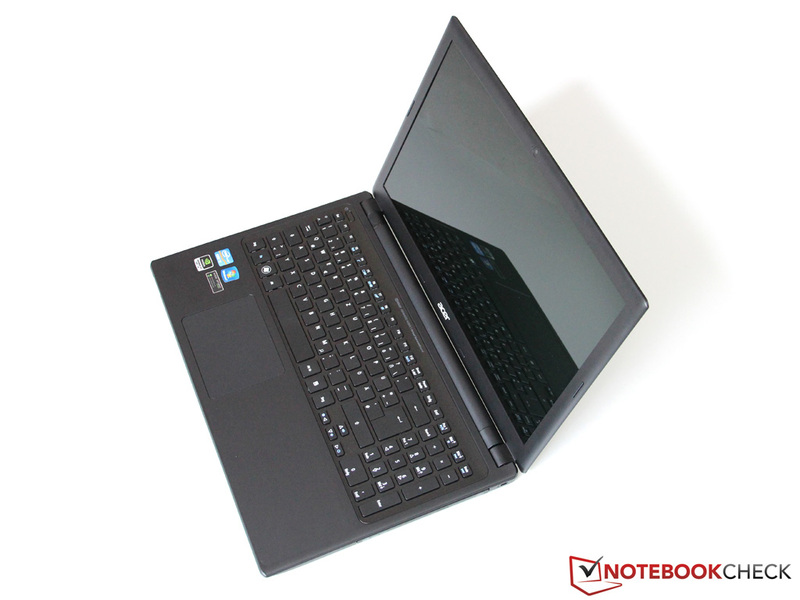 Most ultrabooks like the Samsung 530U3B are considerably more expensive. 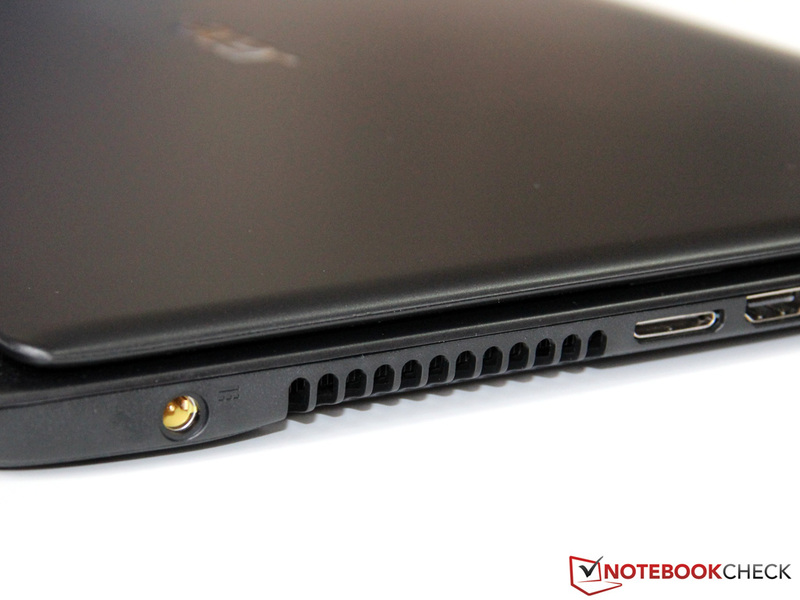 Asus also offers a thin 15-inch model, but the Asus U56E does not make use of ULV components.